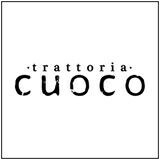 Cuoco is in Seattle's South Lake Union neighborhood, on Terry Avenue between Thomas and Harrison streets. "Cuoco" is the Italian word for "cook", and the inspiration for showing off our chefs in an open kitchen. The pasta work station is framed in crisp white tile and surrounded by warm gold and red walls. In addition to the featured fresh pastas, there are savory vegetables and other hearty entrees.